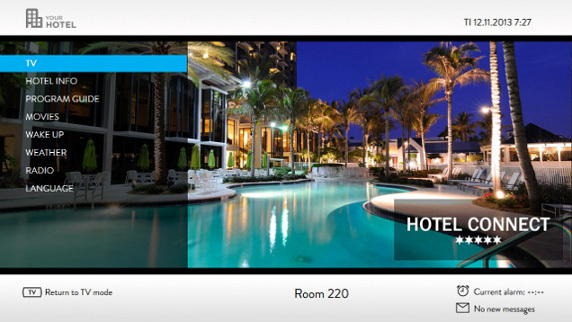 It cannot be stressed enough how important an IPTV system is for your hotel. It is used not only to provide an entertainment system in the rooms, but can also be used for promotion and cross promotion of hotel services. Using the right system can help you deliver highly personalized services and truly deliver a superior return on your investment. IPTV is Internet Protocol Television. It is a way to deliver televised content, but instead of using satellite or other traditional means, it uses the internet and packet delivery to deliver the feed over a Local Area Network. Unlike other media, IPTV gives you the opportunity to stream the media before it has even been transmitted fully, and hence it is known as streaming media. What Are The Benefits Of The IPTV? If you own a hotel, and are looking to provide a hotel TV system that your clients can use to entertain themselves, then there is no option that is better than the IPTV. The reason for this is simple, and that is data. By using IPTV, there is a lot of data that can be collected. The favorite channels that the guest likes to watch can be noted, favorite movies and movies similar to the favorite movie can also be noted and offered to the customer. IPTV also makes offering Video on Demand, or VOD easier. A hotel room is a very confining place for anyone and so it is important to offer the right kind of entertainment, which might not always be airing on TV. Having VOD that offers a wide variety of movies or television shows makes it more appealing for a customer to keep coming back to the hotel over and over again. Usage can also tell you other things such as whether the customer would like a bottle of water delivered to his room, if he’d like to take the limousine to the airport and the list goes on and on. Delivering such personalized content helps build a loyalty to the hotel itself. If the customer feels like he is getting a special service, then he would probably like to stay at the hotel again in the future. An IPTV system is a giant effort to adopt. Several factors need to be considered before you select an IPTV system for your hotel. Make sure that the system has workflow management. This is very crucial. It is the workflow management that is the backbone of any IPTV system. The other thing to consider is what your consumers want. Take feedback from the guests about the system and evaluate your needs accordingly. A hotel caters to its guests so why shouldn’t its entertainment system also cater to them? Find the right provider. Make sure that the provider you choose is reputable. Look at the products that this provider offers. Read the reviews of the product carefully. Analyze the costs of the products offered and verify whether you really need the services that are offered. Ask other hotels that have adopted the IPTV system. This works the best as it gives you a firsthand experience of an IPTV vendor. Follow all these steps and you can choose the right IPTV service provider for your hotel.